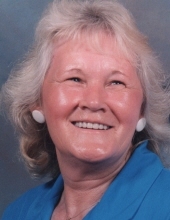 Dorothy A. Estep, 73 years of age of Grundy, VA, passed away Monday, November 12, 2018 at her home. Born June 15, 1944 in Grundy, VA, she was the daughter of the late Charlie and Mary Dotson Adkins. Dorothy was a dedicated homemaker who enjoyed gardening, loved cooking and canning and was a member of the Hurley Church Of God In Jesus Name. She was a loving wife, mother, grandmother, great-grandmother and sister. In addition to her parents, she was preceded in death by her daughter Amanda Lynn Estep, brothers Jack Adkins and Estil Adkins, sisters Hazel Hurley, Stella Hurley, Zela Olson, and brother-in-law Ellis Hunt. Survivors include her loving husband of fifty-four years Ezra Estep of Grundy, VA; sons James “Shotty” Estep and wife Donita of Grundy, VA, Ezra “Hunky” Estep and wife Melody of Lillington, NC; sisters Gladis Hunt of Hurley, VA, Grethel Ferrell and husband Ricky of Hurley, VA; brothers Ernest Adkins of Hurley, VA, Sherman Adkins and wife Cathy of Hurley, VA.
She is also survived by her grandchildren: Savannah Boyd and husband Logan, Chandler Estep all of Grundy, VA, Jake Estep, Luke Estep and Cade Estep all of Lillington, NC; one great-granddaughter on the way, many nieces and nephews. Funeral service for Dorothy A. Estep will be held at the Shortridge-Ramey Funeral Home Chapel of Grundy, VA, Friday, November 16, 2018 at 11:00 a.m. with Pastor Gary Charles officiating. Burial will follow in the Mountain Valley Memorial Park of Big Rock, VA. Active pallbearers will be Logan Boyd, Larry “Buddy” Wolford, Jimmy Marcum, Michael Sykes, Ronnie “Papa” Davis, Timmy Fletcher, James “Butch” Aestue and Kermit Hurley. Honorary pallbearer will be her special care giver Gladis Hunt. The family will receive friends at the Shortridge-Ramey Funeral Home Chapel, Thursday, November 15th after 6:00 p.m. The family of Dorothy A. Estep have entrusted the care of their loved one to Shortridge-Ramey Funeral Home of Grundy, VA.
"Email Address" would like to share the life celebration of Dorothy A. Estep. Click on the "link" to go to share a favorite memory or leave a condolence message for the family.